Best of Concord: The Common Man Readers liked these bathrooms for the folksy sayings (recorded by Auntie Henrietta). Thank you for the wonderful job performing at my 70th birthday!l know it was a long drive to Connecticut, but you gave us such a gift of laughter. We are still talking about! Many folks thought you were my real aunt as you had memorized all the details of my life. What a gift you are. Thank you so much! Saw Auntie at the Veterans Center in White River, Vermont. She was so funny! I hadn’t seen some of these vets laugh in years. Auntie Henrietta was invited to be a performer at the Women’s Leadership Summit on Wednesday, June 11, 2014. Her performance was outstanding. The audience loved her! Her humor matched the audience perfectly. She was funny, interesting, and creative. I found her to be a class act. Her roasting of me was sensitive and carried out in a manner that was appropriate. All in all, her act added great value to the day. Thank you Mary! Paulette and I would like to thank you for a wonderful and memorable performance at our wedding reception…. We are constantly receiving compliments from relatives and friends about how this was the best wedding reception, they had ever attended…. You were the hit of the night! Thank you for making this day special! On behalf of our entire family, please accept our sincerest gratitude for making our Mother’s 80 birthday party a memorable occasion…. Your performance was exceptional and far exceeded our expectations….. Thank you so much for being part of this special occasion. Your comedy is hysterical and I have to spend extra time in the ladies room at the Common Man Inn just to listen to your insights on local happenings!! We wanted to thank so much for the great show you performed at our retirement party for our friend Peggy. Everyone loved you… it was such a hit. I’ve known Mary Vittum (aka Auntie Henrietta) for 25 years. She has grown into a very creative, reliable and “fun” entertainer. I’m glad to have seen such success for her…She deserves it all! Auntie Henrietta’s performance last evening created one of the most memorable, warmly touching and outrageously funny retirement tributes that I have witnessed in my 27 years hosting events. Auntie Henrietta’s command of the audience filled the room with touching comradery, boisterous laughter and an atmosphere in which not one of the over 100 guests inched their way to the door for that early exit. I hope to witness her again and again. 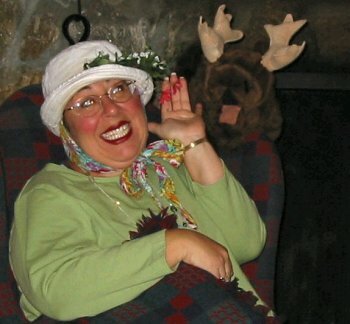 We Love having Auntie Henrietta entertain here! Auntie Henrietta – Thank you in advance for providing the entertainment at our 2016 BA Alumni Banquet.